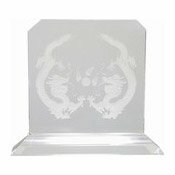 Description: This beautiful crystal-like square plaque features a pair of Chinese dragons on either side of a flaming pearl. 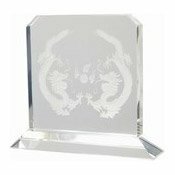 The ornament is made from glass and has a glass base to maximise light reflection and refraction. 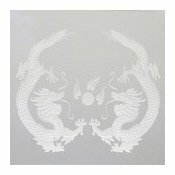 In Chinese folklore, the Dragon is an extremely powerful creature that is said to symbolise auspicious power. As a Yang force, the Dragon is often pictured with its Yin counterpart; the Phoenix. The dragon is seen as being so powerful that it can control the weather, and is in particular associated with water as the bringer of rain. The flaming pearl depicted with the dragons is associated with wealth, good luck, and prosperity.